How can we serve our city in creative ways? That’s the question we asked that almost got us arrested. We were trying anything and everything we could to serve, so when we heard there were movies at the park every Wednesday, we jumped on the opportunity. We could go down and hand out free water bottles to everyone who was on their way to the movie. It could be a simple way to serve on a hot summer night. We showed up with a couple cases of water and began giving them away. Our neighbors loved it. It was hot, and many of them hadn’t thought to bring something with them. However, the event organizers weren’t happy. To be clear, we should have contacted them first. We didn’t think about it all that much since we weren’t actually in the park or at the event. When the police approached, we weren’t really concerned. They usually just want to make sure you’re not selling something. We informed them we weren’t, but we were still asked to leave. Actually, “asked” is a really nice way of saying it. It was the closest we’ve been to being arrested while trying to serve. For years, we reached out and asked if we could serve in some way, but the door remained closed. It wasn’t until 10 years later, after serving alongside the city with The Arts & Music Festival, 1 Day, and many other projects, that we finally built the trust that enabled us to break through that barrier! Now we not only get to serve at Movies under the Stars, but the city has invited us into the event as a sponsor partner. 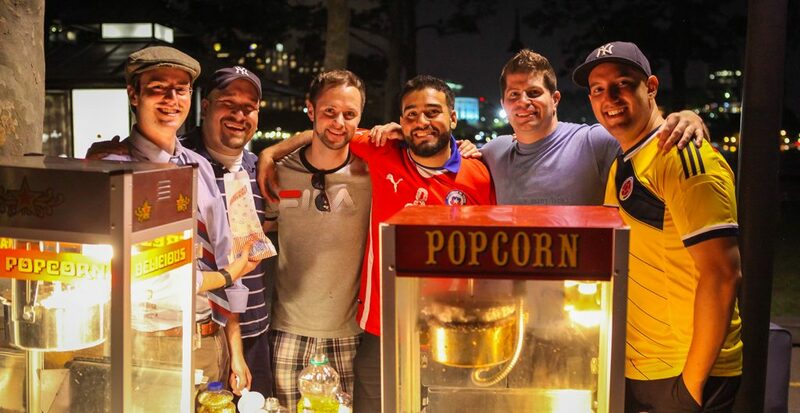 Each Wednesday night, a team is serving our city by handing out free popcorn to those at the event. It’s amazing what can happen when you love not just for a moment, but for years! To get involved and join in on an upcoming Wednesday, email James@hobokengrace.com.